In most developing countries, access to qualified healthcare is rare and typically reserved for the wealthy. To combat this growing disparity, medical professionals around the world donate their time and expertise to provide free healthcare to local populations in these countries. In early September, five of NMC’s providers and staff answered God’s calling and traveled to the Dominican Republic to serve on a week-long medical mission trip organized by Medical Ministry International. Surgeons Emily Webb, MD, and Kevin Miller, MD, were accompanied by nurse anesthetist Jeff Hansen, operating room nurse Ariel Smith and surgical technician Marcos Campos. 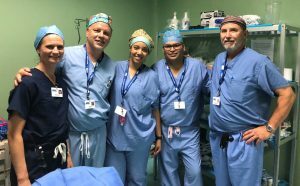 They joined an additional 32 medical professionals and family members, and together the group provided much needed medical and surgical care to the Dominican people. After arriving, the group of 37 split into two teams. The first traveled to different towns each day with a local primary care physician, dentist and optometrist to care for basic needs. The rest, including the team from NMC, traveled every day to a hospital an hour away to perform surgical procedures. Drs. Webb and Miller focused on women’s surgeries, such as hysterectomies, while general surgeons had cases for hernia repairs and gall bladders. Because medical supplies were limited, the surgical teams washed and re-washed many things that would otherwise be thrown away in the States. For example, surgical gowns were turned into the bottom sheet on the next patient’s operating room bed. Prepared for this, each person brought a 20 gallon tub full of donated medical supplies, including equipment and medicine. While the surgical teams anticipated limited medical supplies, it took some time to get used to the unreliability of basic utilities. Each day began the same, a wakeup call at 5:45 a.m. with the song ‘One Day at a Time’ playing loud enough for the entire grounds to hear, breakfast and devotional at 6:30 and boarding the buses at 7:15. Every day, upon arrival at the hospital, the team was greeted with a crowd of patients. Before each procedure, the surgical teams prayed with their patients. From there, they spent the day in the operating room, usually leaving between 5:30 and 6:30 p.m.
On their first day, there were ten major and four minor cases performed, and the next day consisted of 15 major and 5 minor cases. However, that was just the beginning as they performed 15 major and 8 minor procedures on their third day, and the fourth continued the upward trend with 17 major and 7 minor cases. Major cases included open gallbladders, hernia repairs, open hysterectomies, tubal ligation, etc. Minor cases were what the team calls ‘lumps and bumps’. By the end of the week, the three surgical teams performed 73 major and 26 minor procedures. “I’m impressed that we were able to do 99 hospital procedures with only three operating room beds in just five days,” said Dr. Webb. By comparison, NMC averages around 90 surgical procedures in five operating rooms each week. This includes orthopaedic, endoscopic, plastics and other specialties in addition to gynecologic and general surgery procedures. While those from NMC shared their surgical expertise, the other half of the group treated patients in the local clinics. As a result of their care, 328 clinic patients were seen, along with 65 dental patients and 224 optometry patients. 1,429 prescriptions were written and 51 glasses provided. Overall, an outstanding 661 people were provided health education and 33 accepted Christ into their hearts.